Apparently the Avengers Infinity War minimates has been released earlier this week and I gotta ay, it’s hard not to pass up on these two-inch figures from Diamond Select Toys. So let’s check out what’s available where and break down the lineup for the Avengers Infinity War minimates wave 1. 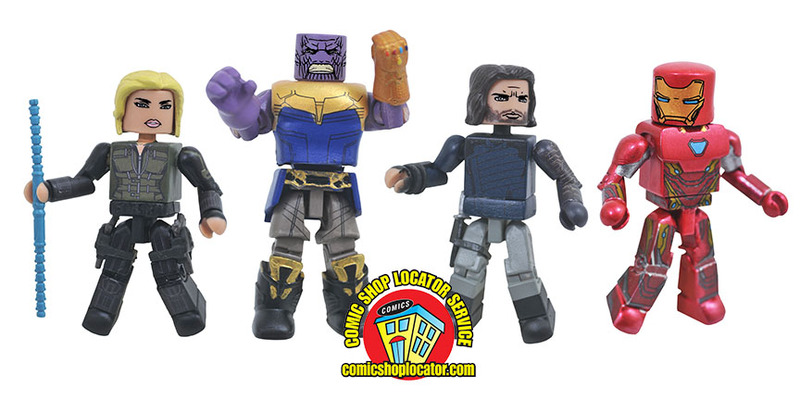 The War Reaches Comic Shops with Avengers: Infinity War Minimates! War has arrived! The first Diamond Select Toys products based on Avengers: Infinity War have reached comic shops, with many more on the way! The opening salvo is the Marvel Minimates box set, which went on sale this week, and pre-orders are now open for an assortment of Minimates two-packs. Pre-orders are also open for a variety of PVC Dioramas, action figures and resin statues based on the film! Read on for details, then reserve yours through your local comic shop or favorite online retailer! Look for more products and images in the near future! On sale now at your local comic shop, the Marvel Minimates Avengers Infinity War Box Set includes Iron Man in his Mark 50 armor, Thanos with his Infinity Gauntlet, and two exclusive figures – Black Widow with her batons and staff, and the Winter Soldier with his weapon! The box set has a suggested retail price of $24.99. Adding to the Avengers line-up, Marvel Minimates Avengers Infinity War Series 1 was once a Toys”R”Us exclusive, but is now only available at comic shops! Three two-packs include Iron Man with Thanos, Hulk with Spider-Man, and the comic-shop-exclusive Rocket with Adolescent Groot! Each has an SRP of $9.99. Reserve your set today with your local comic shop! I’ll be sure to pay the local comic shop a visit and see whether they’ve stocked up on these figures or not.